Stockholm, Sweden-based Raw Materials Group held its sixth annual exploration and mining investment conference in Stockholm in November 2009. Representatives from Alcaston Exploration, Boliden, Botnia Exploration, Endomines, Gold-Ore Resources Ltd, IGE Nordic, Kopparberg Mineral, Lappland Goldminers, LKAB, Lovisagruvan, Mineral Invest, Northland Resources, and Platina Resources Ltd, all active in the Nordic countries, gave presentations to an audience of analysts and fund managers from the financial communities of Stockholm, Helsinki, Copenhagen and Oslo. Two of Europe’s leading mining companies—base metals producer Boliden and state-owned iron ore giant LKAB—were both bullish on the future of Nordic mining. Lennart Evrell, CEO of Boliden, saw high but volatile copper and zinc prices in 2010, particularly as mine production is near capacity. At Boliden’s Aitik copper mine, a SEK6100 million expansion is almost completed and will start up in second quarter 2010. LKAB CFO Leif Boström explained that the company wants to make itself better understood by the financial markets as it intends to finance future expansion plans by borrowing in the open market. Boström commented that the iron ore market was recovering sharply: LKAB had shipped record export volumes in October and pellet production for 2010 was mostly sold out. Strong metals demand from China was discussed by Jiang Guofeng, an analyst at Beijing-based Antaike Information Co. For 2010 he expected a fall in copper imports by some 50% compared with 2009, which would result in a balanced market. A much more optimistic scenario was outlined by Jim Lennon of Macquarie Bank: he saw lead demand outpacing supply mainly because of strong Chinese auto industry output growth. RMG’s Magnus Ericsson stated that new iron ore producers in northern Europe are set to win market shares as European steel mills try to find alternative suppliers rather than having to rely solely on Brazilian giant Vale. This will favor the progress of Northland Resources’ Pajala mine project, which is the most advanced of several iron ore projects in Sweden and should become the first new iron ore mine in northern Sweden for many decades. Exploration in Sweden and Finland did take a beating in 2009, but a turnaround seems to be under way. Juniors such as Botnia Exploration and Alcaston Exploration managed to raise capital in the second half of 2009 to continue aggressive exploration programs. An update of the Rönnbäcken nickel project operated by IGE Nordic was released during the conference. Endomines and Lappland Goldminers are raising capital for investments in new gold mines in Sweden and Finland. 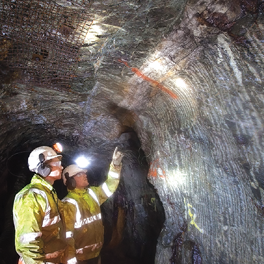 Narrow-vein mining specialist Lovisagruvan is expanding its zinc/lead/silver production while Australian-based Gold-Ore Resources is going underground to extend life of the Björkdal gold mine. And Swedish junior Kopparberg Mineral created a stir when it announced takeover of all of Lundin Mining’s exploration rights in Sweden.